The memorial is sited in the Church of St.Mary, Bibury, Gloucestershire, UK, on a marble plaque. 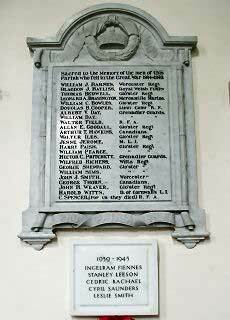 Sacred to the Memory of the men of this parish who fell in the Great War 1914-1919. WILLIAM J. BARNES Worcester Regt. BLAGDON J. BAYLISS. Royal Welsh Fus'lrs. LENARD A. BRASINGTON. Mercantile Marine. WILLIAM C. BOWLES. Glo'ster Regt. DOUGLAS B. COOPER. Lieut. Comr R.N. ALBERT V. DAY. Grenadier Guards. ALLAN E. GOODALL. Glo'ster Regt. HECTOR C. PRITCHETT. Grenadier Guards. JOHN J. SMITH. Worcester Regt. JOHN H. WEAVER. Glo'ster Regt. HAROLD WITTS. D. of. Cornwall's L.I. C. SPENCER. (For us they died) R.F.A.